Our Barron Park coop is located in our small backyard. Our lot is only 5000 square feet, but we tried to make the most of our landscaping in order to maximize our use of space. We have a Bill Finnegan coop that is large enough for 6 hens with an enclosed run, two redwood compost bins (one active and one inactive at all times), a raised bed vegetable garden, and some garden plants that appear to be unappetizing to chickens (found through trial and error). The coop is a modified version of the Jerome (see: http://forthebirdscc.com/blog/) customized by Bill for our space with a large, fully enclosed run that is big enough to fit our composting system, and built around our fruit trees to provide shade. It has reinforced mesh to keep out predators and rats. We currently have three hens: an Easter Egger (Beezus), a Wyandotte (Saphira), and a Light Brahma (Yeti). We raised part of our flock from chicks and one (Ramona) turned out to be a rooster (Ramon) who had to be rehomed. That was heartbreaking. We are currently hoping to add two more pullets to our flock this fall. Our son raised these chicks and received the BSA Animal Science Merit Badge for doing so. Ask us about BSA Animal Science if you have a scout. Our son first encountered chickens as a camper at Hidden Villa, where he developed his love for animals and agriculture. He asked us for chickens for many years and we always said no due to the fact that we have such a small yard. We felt that it would be impossible. However, he was very persistent in his desire to raise chickens. 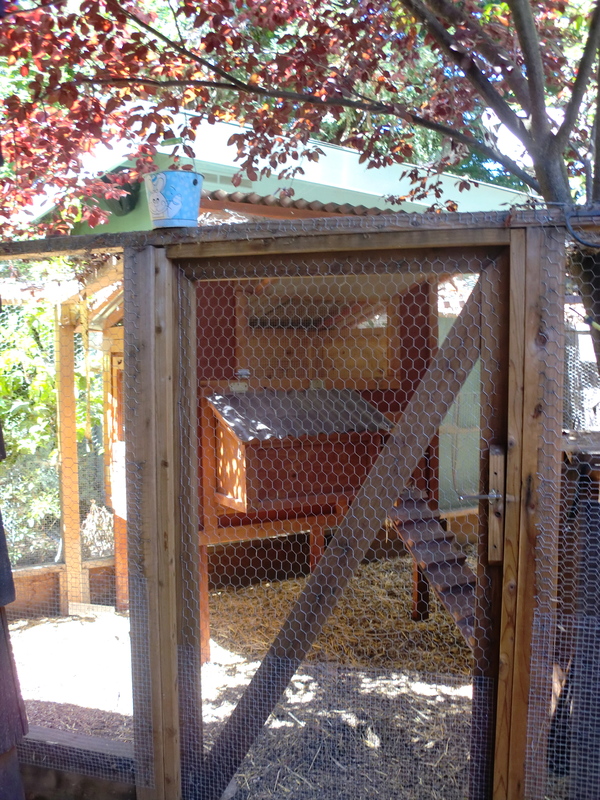 Eventually we researched it and found that it was possible to have chickens even though we have such a small yard. We began to look at coop solutions that could work for our home and also looked at relandscaping our backyard to take advantage of unused space. Eventually we realized that we could have a nice coop, garden, and compost arrangement even with very limited space. We have had our coop for more than a year. Our biggest joy was in receiving our first egg. Since then we have shared our eggs with our neighbors and with Neighbors Helping Neighbors, which helps Palo Alto residents who are having some economic difficulty. We think our unique offering is that our yard is very small but we still have a nice sized coop, run, garden, and composter. We resisted getting chickens because we thought you had to have a big yard. Our contribution to this tour is to show that you can “Do A Lot With a Little.” You don’t have to have a big yard to have a nice coop and we hope that people with small yards — as well as those who don’t want to devote their entire yard to their flock — will see that it is not only possible but easy to have a nice set up without a lot of land. Our favorite aspect of our coop, in addition to the chickens of course, is our composting. We did not compost prior to having our chickens. However, we now are dedicated composters. We keep all of our yard waste out of landfills, and have dramatically improved our soil quality and productivity for our small garden. We also have a patio with sitting area and grill, a pretty little cottage (where Caesar Chavez once lived! ), and have worked with our gardener, the amazing Tony Medina, to utilize plants and greenery in the backyard that are unappetizing to chickens so that we can allow the chickens to free-range in the yard without having a completely denuded backyard. In addition to the water provided by Tour de Coop volunteers, we will also offer Peets Coffee and some snack items for a donation, all proceeds go to benefit Neighbors Helping Neighbors.